After the second round of A-10 play, the conference has shown that after Rhode Island (and still St. Bonaventure), the conference is very even. Out of the 14 teams, only Duquesne and Rhode Island are undefeated, and we are only two games into the conference season. When things are this close, questions arise. Here are a few of the main ones. 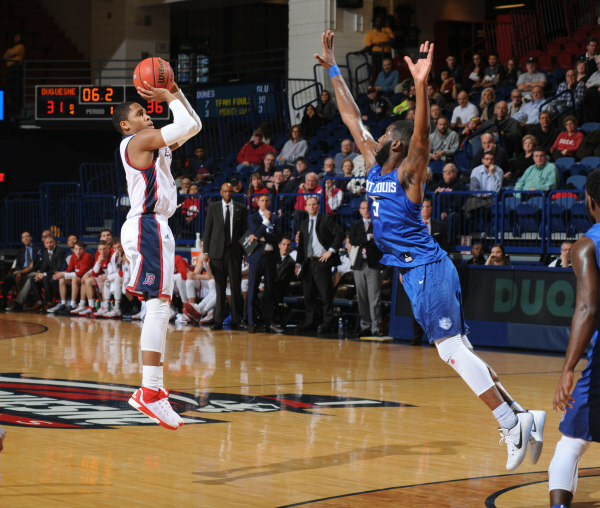 Can Duquesne be a top 6 team in Conference? Not many people expected this before the season began. But after beating Dayton and George Washington to open A-10 play, it is definitely reasonable to propose the question. Whatever Coach Dambrot is doing is working, and the team has definitely bought in. Eric Williams Jr. has emerged as one of, if not the best freshman in the conference. If he starts getting confident shooting the ball, he will become a dynamic threat. Add that with Mike Lewis II and Rene Castro-Caneddy, and the Dukes have a chance to make some noise. After a loss at Duquesne that drew a great deal of criticism from the fanbase, the Flyers responded. And it was quite a response. Beating a strong Bonnies team, rather handley, was exactly what Dayton needed. Darrell Davis has proven his ability to score the ball this season, and if he can continue his production, Dayton will be a team to fear this season, especially at home. One thing to note: Cunningham had a rough time last night, and Dayton still prevailed. Staying out of foul trouble will be key for his success, and also for the team’s success. Can Big-Time players continue to play big? Every team has its key players. For George Mason and Fordham, they finally had breakout games. For the Patriots, Livingston II finally got over the 20 point hump and posted a 33 point game. If the Patriots want to be real competitors this year, Livingston II is going to have to continue to put up big games scoring wise. They don’t always have to be in the 30’s, but they will need to be in the 20 range. For the Rams, Chartouny posted a season-high 26 points in their victory over Richmond last night. Fordham has some good pieces, but injuries have prevented them from making any true progress this year. Joseph Chartouny only has an average of 11 points per game. The Rams need that number to jump, like the game last night. If Chartouny can do that, and take some pressure off of Will Tavares, the Rams will be a much stronger team. If conference play continues like it has started, it will definitely just be a two-bid league (Max). But, it will certainly make for some interesting games, and it will be fun to see how the league unfolds.